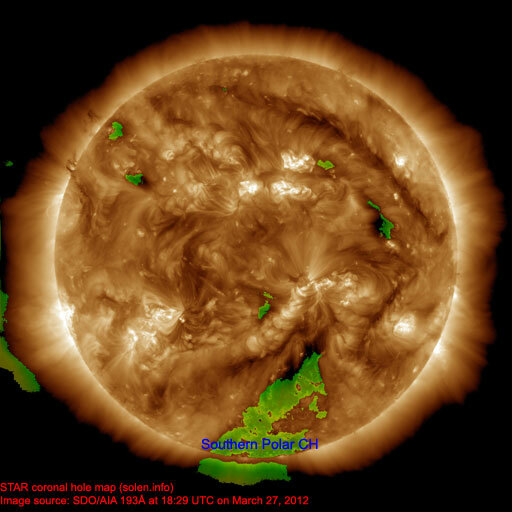 Last major update issued on March 29, 2012 at 04:50 UTC. 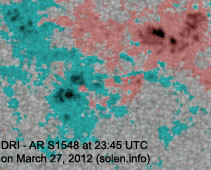 The geomagnetic field was quiet to minor storm on March 28. 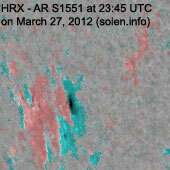 Solar wind speed at SOHO ranged between 359 and 464 km/s under the influence of a low to medium speed stream associated with CH509. 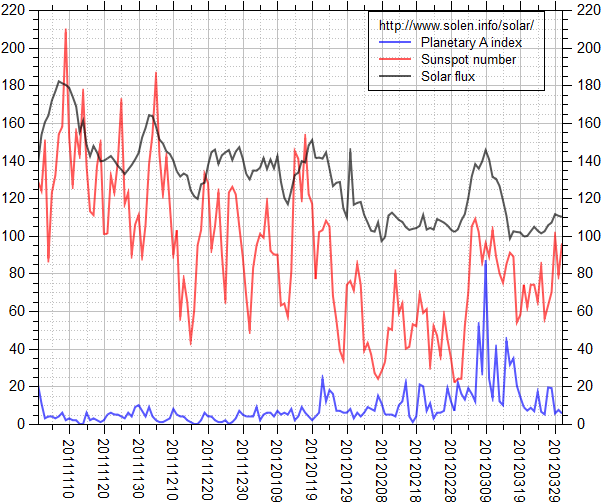 Solar flux measured at 20h UTC on 2.8 GHz was 107.0 (increasing 3.6 over the last solar rotation). 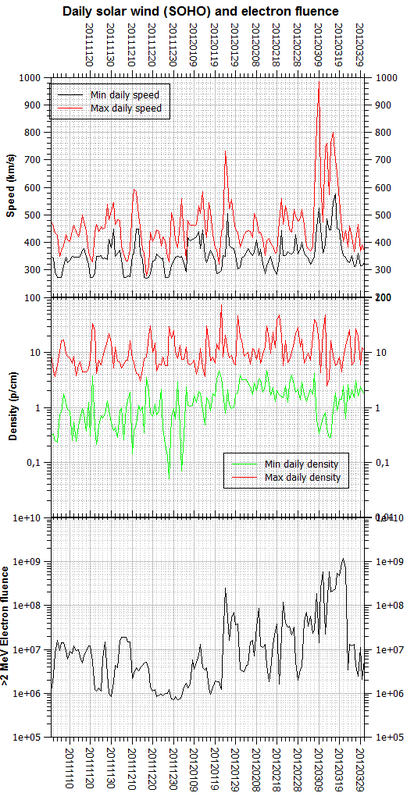 The Potsdam WDC planetary A index was 19 (STAR Ap - based on the mean of three hour interval ap indices: 19.1). 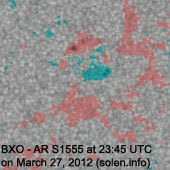 Three hour interval K indices: 55322232 (planetary), 44332221 (Boulder). 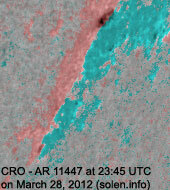 Region 11438 [S14W36] decayed slowly and quietly. 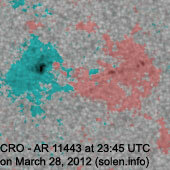 Region 11443 [N13W15] was quiet and stable. 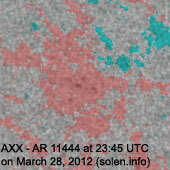 Region 11444 [N19W24] lost the leader spots and was mostly quiet. 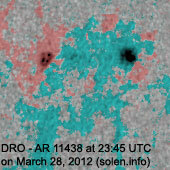 Region 11445 [S23E12] decayed slowly and quietly. 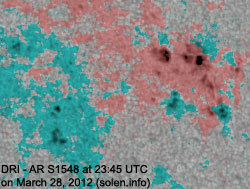 Region 11447 [S24W66] was quiet and stable. 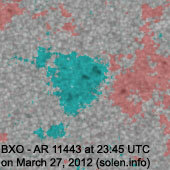 New region 11448 [S17E56] rotated into view at the southeast limb on March 26 and was assigned a number by SWPC two days later. 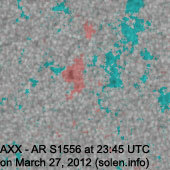 [S1548] emerged in the northeast quadrant on March 23 and developed quickly on March 26. 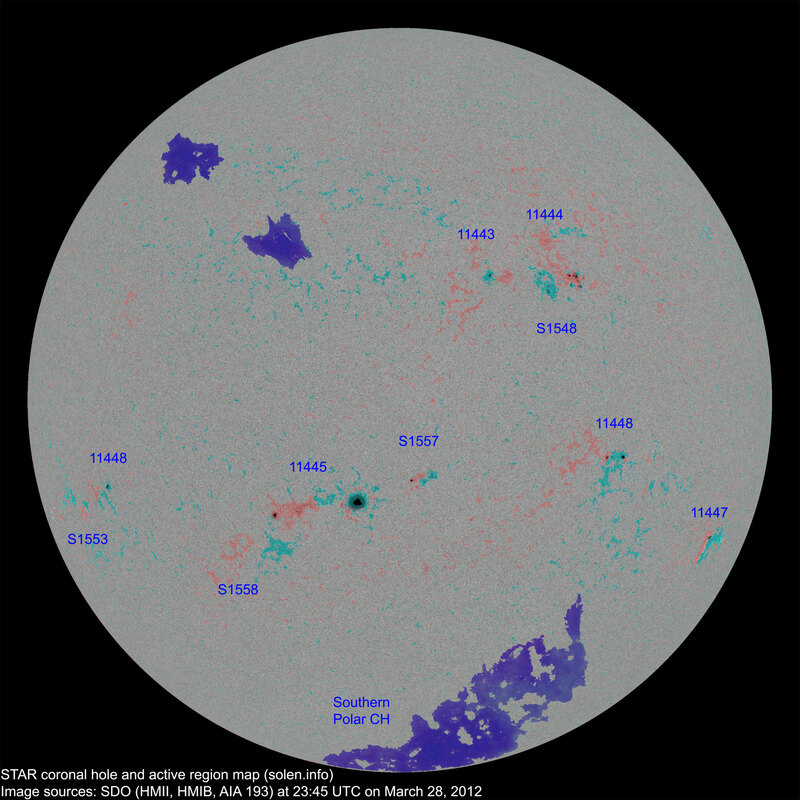 Slow decay was observed on March 27 while new spots emerged in the leading spot section on March 28 resulting in minor polarity intermixing. 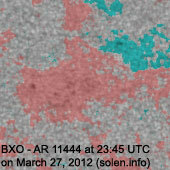 SWPC has this as AR 11442, a region which was originally further west. 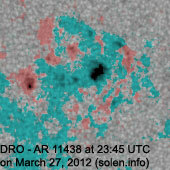 Location at midnight: N13W26. 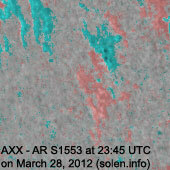 March 26 and 28: No obviously Earth directed CMEs were observed in LASCO and STEREO imagery. 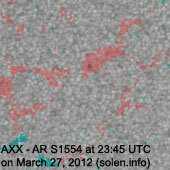 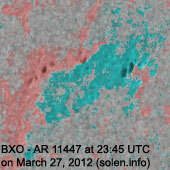 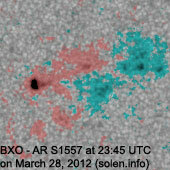 Several CMEs originating in old AR 11429 behind the northeast limb were observed over the last days. 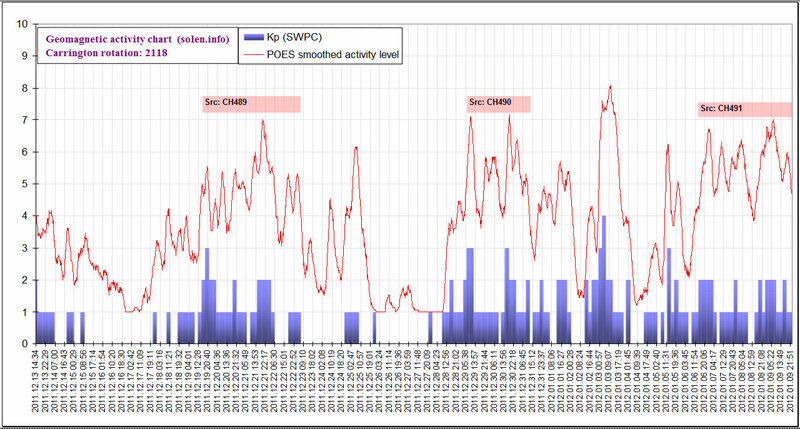 The geomagnetic field is expected to be quiet to active on March 29-30 due to weak CME effects. 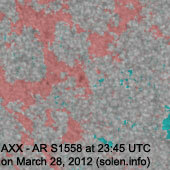 Quiet conditions are likely on March 31. 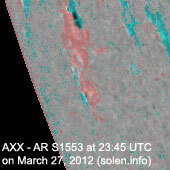 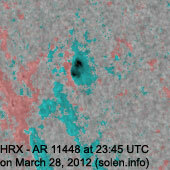 There's a fair chance of an M or X class flare from old AR 11429 behind the northeast limb.